Save $1,000 per couple off this cruise. Expires April 30. Click here for eligible departures. Fly from $299 per person from select gateways on this departure. This deal is combinable with select promotions. Expires April 30. Click here for eligible departures. Pay no single supplement in certain cabin categories on select river cruises. Limited availability on each departure. Expires April 30. Click here for eligible departures. Welcome to Holland. Your Suite Ship® is Ready for Boarding. Flights into Amsterdam must arrive by 3:30 pm. Guests must be on board ship by 5 pm. Your day in Amsterdam is free to explore at your leisure. During tulip season, you may take a Guided Optional Excursion to Keukenhof gardens—with more than seven million tulips, daffodils and hyacinths, as well as other bulbs, planted each year. Outside of tulip season, join a Guided Optional Excursion to Zaanse Schans to see historic windmills and charming Dutch houses. You may like to join a Guided Optional Excursion to Muiderslot Castle, or a Guided Optional Biking Excursion to the Dutch countryside. Take some free time to explore Amsterdam’s colorful streets and canal houses, galleries, and shops. DISCOVERY Choose a Guided Walking Tour of Cologne’s important Jewish heritage sites. Don’t miss the chance to enjoy free time over a glass of Kölsch pale lager—locally brewed for over 100 years! Later, local musicians will join us on board for live entertainment. CLASSIC Enjoy free time in Koblenz this morning before sailing through the Rhine Gorge to Rüdesheim. Sail past the legendary rock of the Lorelei—where the siren of mythology sang songs to lure ill-fated sailors. DISCOVERY Based on your departure date, enjoy either a Coffee Tasting or a Wine Tasting. DISCOVERY Take a Guided Tour of the incredible Mechanical Music Museum for a one-of-a-kind instrumental experience. Enjoy live entertainment on board your ship this evening. ACTIVE Join your Avalon Adventure Host for a Hike up Philosophers’ Way for an inspiring view of the city below. CLASSIC Join a City Sightseeing Tour, including Strasbourg’s gothic, stained-glass cathedral with its celebrated ancient murals and astronomical clock, as well as the magical La Petite France District. You may choose to join a Guided Optional Excursion to the splendid Alsace wine country, or a Guided Optional Excursion to visit the charming village of Colmar, with its half-timbered medieval and early renaissance buildings. Alternatively, enjoy a free afternoon shopping or sampling the local cuisine in Place Kléber. DISCOVERY Join a full-day Guided Tour to the magical Black Forest to experience the Vogtsbauernohf open-air-museum, visit an authentic water mill, and see a traditional butter-making demonstration. Follow your visit to Badische Winzerkeller with a free afternoon in Breisach. Disembark your ship and drive on to Beaune. CLASSIC Visit the Hôtel-Dieu Charity Hospital in Beaune, built in 1443, today home of the Van der Weyden’s painting of the Last Judgement. This afternoon, travel to St. Jean de Losne to board your Suite Ship®. Enjoy leisurely cruising en route to Mâcon along the majestic Saône River. Consider a Guided Optional Excursion to a Chardonnay wine cellar, or to the Castle of Cormatin. DISCOVERY Later, enjoy a delicious Cheese and Wine Tasting hosted by your Master of Wine. Enjoy live entertainment while sailing for Trévoux this evening. Sail for lovely Lyon this morning. CLASSIC Join a Guided Sightseeing Tour to survey Lyon from Fourvière Hill with its numerous churches. You’ll also explore the Old Town with its maze of medieval alleyways, and the lively cafés, monuments, and famed fountain of Place des Terreaux. Spend free time riding a bike through Lyon’s town squares, over bridges, and along the banks where the Rhône and Saône rivers meet. DISCOVERY Enjoy a pastry demonstration hosted by a French chef on board your ship. Later enjoy live entertainment after dinner. DISCOVERY Join a Culinary Walk through the city to discover why Lyon is known as the gastronomic capital of France. The rest of your day is free to explore, relax, or shop in France’s third largest city. Take a bike from the ship and explore local produce markets and parks, or take a leisurely tour of the city’s more than 100 murals. Later, enjoy live entertainment on board. CLASSIC Take a morning Guided Walking Tour to explore Tournon—one of France’s oldest medieval cities. See its 16th-century castle, and Roman ruins between the Rhône River and the granite slopes of the Hermitage. DISCOVERY Enjoy an onboard chocolate and wine tasting hosted by your Master of Wine. Enjoy a leisurely sail to Viviers after lunch. DISCOVERY Explore the pale-stone buildings of Viviers on a late afternoon Guided Walking Tour of this charming village. You’ll see its Romanesque cathedral and Old Town with a mix of historical Christian, Roman, and medieval influences. During the tour you will also discover and taste local specialties. CLASSIC Take a Guided Sightseeing Tour of the fortress city of Avignon—with its ramparts encircling the city—and a visit to the amazing Palace of the Popes. Explore Avignon on your own for the city’s art and culture, theatre, and museums. Be sure to snap photos of the captivating countryside, historic monuments, and the medieval Pont Saint-Bénézet. DISCOVERY This evening, join an onboard food and wine pairing dinner hosted by your Master of WineLater, enjoy onboard live entertainment. ACTIVE Join your Avalon Adventure Host for a Morning Walk. DISCOVERY Attend a Painting Workshop to learn the style and techniques of Vincent van Gogh. You’ll create your own painting in the style of the classic master who took inspiration from the Provence light and landscape in Arles. Consider a Guided Optional Excursion to the Carrières de Lumières (Cathedral of Images) to immerse yourself in a truly unique experience of art, sound, and light in the old quarries of Val d’Enfer. Take advantage of any free time remaining with a stop in Le Café Van Gogh for a glass of wine, to relax and watch the world go by. 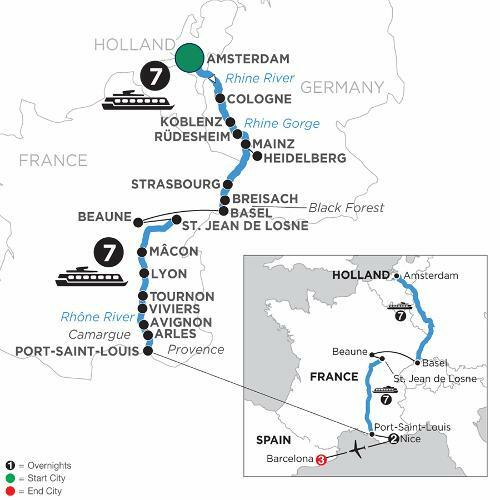 Join a culinary adventure on your European river cruise with unforgettable views along the Rhine and Rhône Rivers. Enjoy special excursions and activities to highlight great regional cuisine and wine. Enjoy the landscapes of Burgundy and Provence to sample the best food and wine in Lyon and Viviers. Your culinary cruise includes a pastry demonstration; a chocolate, cheese, and wine tasting; and a food-and-wine pairing dinner hosted by your Master of Wine on board. Cruise through Amsterdam’s iconic waterways, then sail on the Rhine River to Cologne for a tour of the city or its historical Jewish sites. Sail through the Rhine Gorge to Rüdesheim, and visit the Gutenberg printing museum or the Heidelberg Castle while in Mainz. Explore Strasbourg’s La Petite France District, and sail to Breisach, Germany, gateway to the Black Forest. Visit the largest wine producer in Europe at Badischer Winzerkeller winemakers, and taste wines in the vineyards of Baden. In France, see Beaune’s Hotel-Dieu Charity Hospital, and sail to the Chardonnay wine region of Mâcon, with cheese tasting on board. Explore Lyon, France’s gastronomic capital, and enjoy a guided culinary walk. Nestled amid vineyards are the twin cities of Tournon and Tain l’Hermitage. Take a guided walk through the Roman ruins in Tournon. Visit charming Viviers, historical Avignon, and Arles on the Rhône River. Join a painting workshop a la Van Gogh whose work was inspired here. Your French river cruise concludes in Port-Saint-Louis. Continue your vacation after your cruise with two nights in Nice and three nights in Barcelona! Enjoy buffet breakfast daily, guided sightseeing, assistance from your Monograms Local Host®, destination guide with city map, flight from Nice to Barcelona, and transfers to or from ship, hotel, and airport. In the event of technical or water level issues, it may be necessary to operate the itinerary by motorcoach or alter the program, including hotel overnight when necessary. Guided Tours, Optional Excursions, activities, sailing and docking schedules may be contingent on weather conditions or other issues outside of our control and could therefore be subject to change at any time. Please check visa requirements with your local consulate(s); responsibility for obtaining visas rests with the traveler. Dates and Prices do not include air travel. Participation in this vacation requires purchase of the following flights from Avalon Waterways, not included in the pricing: (1) roundtrip air from your U.S. gateway and intra-vacation air segments; or (2) intra-vacation air segments only, starting at $245. Required intra-vacation air segments: Nice to Barcelona. Air prices were effective on February 7, 2018, and their availability is limited. At the time you purchase your tour, air prices may be higher. Gratuities to Local Guides & Excursion Drivers are included on Avalon portion only. All prices per person based on double occupancy. Prices shown include cruise in Category E in a deluxe outside stateroom on Indigo Deck. Cabin upgrades are available.